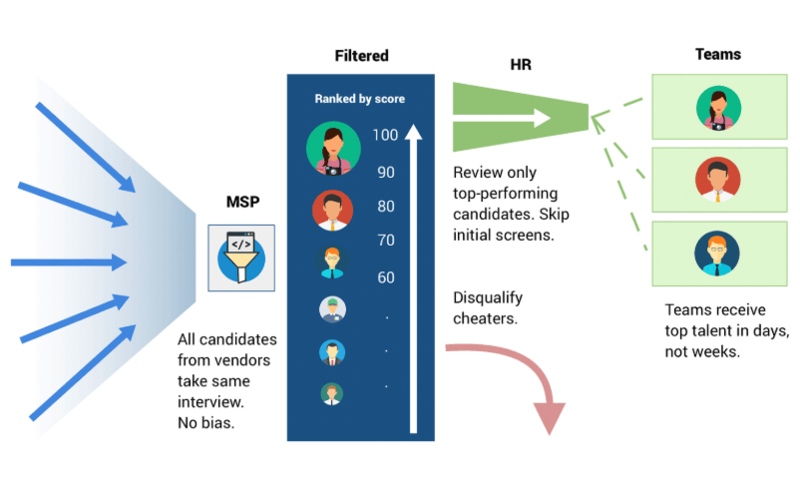 Filtered has built the full workflow for companies acting as staffing MSPs (managed service providers). A handful of Fortune 500 companies are using Filtered to streamline their contingent workforce. First, hiring managers request to hire new talent. Filtered works with HR and hiring managers by preparing specific technical questions. HR then posts these interviews. All associated vendors will be notified of a new interview and open position. Later, HR and other decision makers can click on the attached Filtered links inside their ATS and review the candidates. All information, from questions to confidence analysis, will be included in the review. MSP admins will receive weekly leaderboard reports about vendor performance. Vendor admins will receive similar weekly reports about their recruiters.